This episode brings us a great talk with community member Anthony. While he’s not completely new, he is still on the journey. His original idea was to use trading as supplemental income but realized that there is a lot more potential there. As Anthony kept learning more about the markets he realized that he had a lot more to learn. He spent a good amount of time reading books and watching video online about the topic. He also realized that there was more opportunity in the US market versus the Canadian market. Currently he is focusing on trading strictly in the morning while maintaining his regular job. While he aspires to trade full time he realizes that it would be irresponsible to quit a steady job before he’s truly proven he is consistent. These are all just some of the talking points we hit. Let’s get to it! Today we interview community member Anthony. While he’s not completely new, he is still on the journey. His original idea was to use trading as supplemental income but realized that there is a lot more potential there. 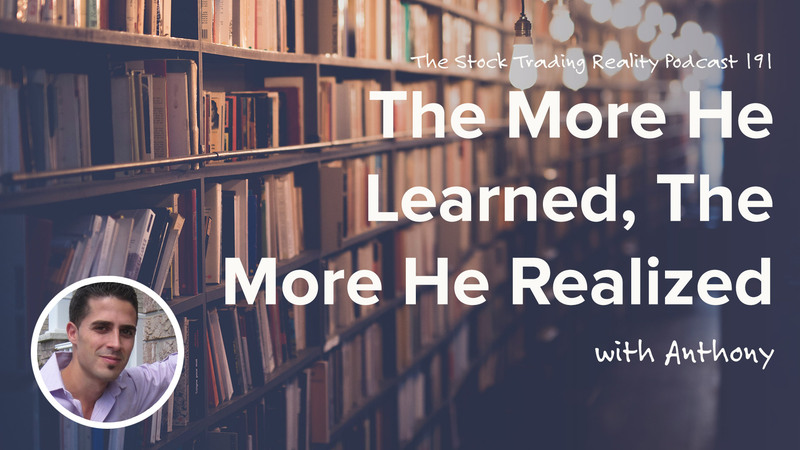 As Anthony kept learning more about the markets he realized that he had a lot more to learn. He spent a good amount of time reading books and watching video online about the topic. He also realized that there was more opportunity in the US market versus the Canadian market. Currently he is focusing on trading strictly in the morning while maintaining his regular job. While he aspires to trade full time he realizes that it would be irresponsible to quit a steady job before he’s truly proven he is consistent. Anthony is focusing on getting licensed in Canada to manage others money if he so chooses. Ultimately this will be an option he can choose to utilize if he would like. Options in the job market is always a positive. Similar to any profession, a key to progressing forward is the ability to recognize your strengths and your weaknesses. Anthony is familiar with where he is falling short but also realizes what attributes help him make money on a regular basis. I do feel comfortable trading on my own but I’m not comfortable making alerts for other people. I was watching for news that would move the price. I was using line charts at this time too. One day I bought in the first 5 minutes and then it just dropped. I thought ‘it will stop, it will stop, it will stop.’ I gave back all my gains from the prior week. I’d say it’s close to 50/50 but I let the winners ride and cut the losses. Sometimes I still rush into trades and I need to work on that. I also need to spend more time on education.